The maximum peak voltage appearing at the terminals of the variable frequency drive (VFD) fed motor depends on many factors, predominantly the cable length. When supplying motors with variable frequency drives, the following practical rules are suggested for the evaluation of the need of using filters between motor and variable frequency drive. The output reactor is necessary for the eddy current that flows from variable frequency drive to earth to be limited. The input (line) reactor prevents the variable frequency drive ground fault from tripping. The output reactor design must take account of additional losses occurring due to current ripple and current leakage to earth, which increases as cable length rises. For long cables and reactors designed for small currents there will be great influence of the leakage currents on the reactor losses (and heating). The cooling system of the variable frequency drive panel must also take the reactors additional losses into account for a safe temperature operation to be assured. The output reactor must be installed near the variable frequency drive, as shown below. L2 = Output reactor – must be installed next to the variable frequency drive. The characteristics of the cable connecting motor and VFD, as well as its interconnection and physical location, are extremely important to avoid electromagnetic interference in other devices. Three-core unshielded motor cables can be used when there is no need to fulfill the requirements of the European EMC Directives (89/336/EEC). Certain minimum distances between motor cables and other electrical cables must be observed in the final installation. These are defined in the table below. Emission from cables can be reduced if they are installed together on a metallic cable bridge which is bonded to the earthing system at least at both ends of the cable run. The magnetic fields from these cables may induce currents in nearby metalwork leading to heating and increasing losses. They help to reduce the radiated emission through the motor cables in the Radio Frequency range (RF). They are necessary when the installation must comply with the EMC Directive 89/336/EEC as per EN 61800-3. They are also necessary when using Radio Frequency Interference Filter (whether built-in or external) at variable frequency drive input. Minimum distances between motor cables and other electrical cables (for instance, signal cables, sensor cables, etc.) must be observed in the final installation, as per table below. IEC 60034-25 presents cable types and construction details. The basic given recommendations are summarized in the figures below. For more details and updated information the current standard version shall be consulted. 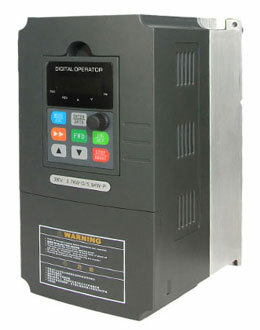 The grounding system must be capable to provide good connections among equipments, for example, between motor and variable frequency drive frame. Voltage or impedance differences between earthing points can cause the flow of leakage currents (common mode currents) and electromagnetic interference. Cable shield must be grounded at both ends, motor and variable frequency drive. Good EMC practices such as 360° bonding of the shields are recommended, in order for low impedance for high frequency to be provided. For the shield to operate also as protective conductor, it should have at least 50% of the phase conductors' conductance. If the shield does not have enough crosssection for that, then a separate earth conductor is needed and the shield provides EMC and physical protection only. The shield high-frequency conductance should be at least 10% of that of the phase conductors.